Prairie State Model 450 Model Flat Top Acoustic Guitar, made by Larson Brothers (1931), Chicago. 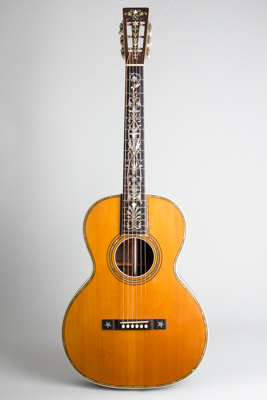 This guitar is a beautiful and fascinating highest grade example of the Larson brothers' workmanship, made just as they were introducing the new Prairie State line in 1931. This brand was created for instruments carrying August Larson's newly patented structural innovations, which in this case include a metal tube through the body to relieve stress on the top, and a beautifully fitted bolt-on neck attachment system. The guitar carries a date stamp on the underside of the top of OCT 23 1931. It also bears stamps on the backstrip of three separate patent numbers, the latest being #1,818,631 which had just been granted on August 11 that year. This very fancy guitar would likely have one of the first instruments built with this system, and may have been designed as a showcase piece. The Larsons were no strangers to innovation; by the late 1920s the brothers had been building guitars for over 25 years and August's concern was making them more resistant to steel string tension. The laminated braces used on this guitar make the top stronger without heavy construction. Larson necks use laminated woods with thick ebony fingerboards; most have proved very stable. August's concerns were now how string pull caused the guitar to fold inwards, raising the action. He sought to alleviate this by deflecting tension as much as possible from the top and back. His solution was to join the heelblock to the endblock, bracing them against each other with a substantial steel tube set lengthwise through the body. He also pioneered bolt-on necks in fine acoustics, filing two 1930 patent applications for several ways to do this with or without the internal rods. This guitar's neck is secured to the upper rod and a screw near the tip of the heel makes it adjustable for angle. Around the same time, Chicago's Kay company employed angle-adjustable bolt-on necks on their early "KayKraft" archtops but in a comparatively crude and awkward manner. The circa 1932 Maurer catalog specified guitars with the patented fittings as "Prairie State" brand, also noting "it is of special advantage in large guitars". The first guitars with August's rods were otherwise conventional 12-fret neck instruments. This early top-of-the-line Prairie State Model 450 is especially elegant, the largest and most expensive instrument offered in the catalog at $100 and with the fanciest possible trim. This includes multi-bound edges, abalone, and herringbone inlaid along the sound hole edges, floral inlaid headstock, and an incredible elaborate tree-of-life fingerboard inlay. The back and sides are beautiful Brazilian rosewood and the top very fine-grained spruce. The tuner buttons are genuine pearl, a feature only offered on the Style 450. This is a fantastic-sounding and excellent-playing guitar. It has the Larson bright-but-rich tone in spades, and the metal tubing does seem to add an ethereal grace to the sound, almost as if a ghostly harpsichord is playing along. The bolt-on neck is a very rare feature, and appears to have been seldom ordered. This guitar is an absolute showpiece for the Larsons' artistry, both in construction and aesthetics. It is one of the finest and best-preserved of the Brothers' instruments we have ever had, and that's saying a lot! Overall length is 39 1/4 in. (99.7 cm. ), 15 in. (38.1 cm.) wide at lower bout, and 3 1/4 in. (8.3 cm.) in depth at side, taken at the end block. Scale length is 25 1/2 in. (648 mm.). Width of nut is 1 7/8 in. (48 mm.). This guitar remains in spectacularly beautiful original condition, showing only some light finish wear and some few typical repairs. There are small dings and scrapes to the finish, but the only loss to the lacquer is some worn off the back of the neck. The grained ivoroid fingerboard binding appears to be replaced, but it does not appear to have been refretted. The bridge is a just slightly larger reproduction to allow for a gently angled saddle, built to the Larson pattern with the original engraved star inlays added to the wings. There are two old spruce grain top cracks behind the bridge sealed up long ago; no other cracks are apparent. It appears that a newer small re-inforcing plate may have been added to the heelblock for the neck attachment bolt to secure to, but it may be original; this system is seldom seen in practice, so it's hard to be sure! This guitar has its own unique sound and feel, unlike any other vintage or modern instrument. We like to imagine August Larson beaming as he and his brother finished it out in 1931, a showcase for all they had achieved up to that point over the 30+ years of their shared career. Excellent Condition.